1.1 Output: Continuous current 120A, burst current 240A. 1.3 BEC Output: 6V/ 3A switching mode BEC. 1.4 Suitable Motor: Sensorless Brushless Motor. 1.6 Size: 94mm(L) * 33mm(W) * 18mm(H). 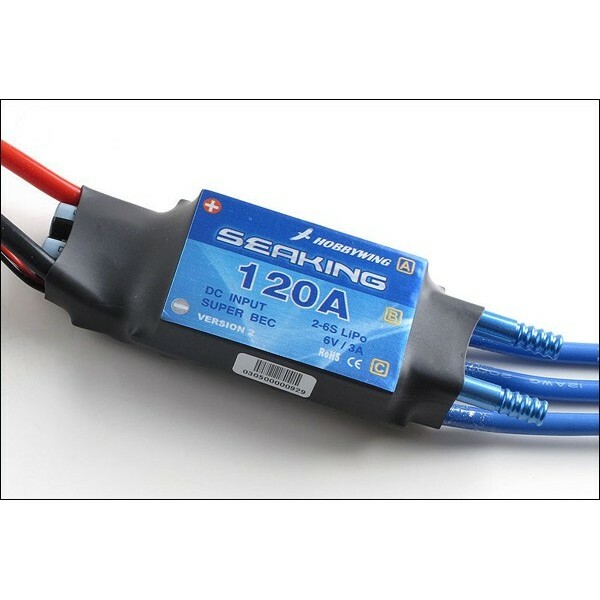 2.1 Use top quality electronic components to enhance the current endurance ability of the ESC. 2.2 Special designed for RC boat, with excellent start-up, acceleration and linearity features. 2.3 With water cooling heat-sink and the whole ESC is waterproof to get a longer life. 2.4 With 2 running modes ("Forward" mode and "Forward/Backward" mode). 2.5 Multiple protection features: Low voltage cutoff protection to prolong the battery life / Over-heat protection / Throttle signal loss protection. 2.6 With 8 steps of timing adjustment, compatible with most of sensorless brushless motors. 2.8 Multiple program methods supported: Transmitter stick, LED Program Card. Very easy to program the ESC at home or at the racing field.